On November 18, 1802 Wm. Constable sold to Garret Van Horne, David M. Clarkson and their associates the Town of Potsdam, 10 miles square, except a strip 2 miles wide on the northwest side next to Madrid. The western part of this 2-mile strip had been sold by Constable to Ogden and was known as the Ogden Tract and the eastern half to Charles Le Roux called the Le Roux Tract. The first settlement of the Town of Potsdam was begun by Benjamin Raymond, the agent for the proprietors (Clarksons, etc.) in 1803. In May of that year he left Rome with a bateau laden with mill irons, provisions and six men, and proceeded by the difficult and tedious route of Wood Creek (Locks at Wolf Rift in the canal connecting the Mohawk with Wood Creek and Oneida Lake were completed in 1797 according to Eastman’s History of New York State, 1832, page 359, Museum book), Oneida Lake, Oswego River, Lake Ontario, and the St. Lawrence River to Point Iroquois above Waddington, where he left part of his load and proceeded to open a way through the forest to Potsdam. He struck the river some distance below; here he built a raft and ascended ½ mile to the falls where he arrived in June. Here he built a temporary hut and commenced building a sawmill which he got into operation that year (1803). During the summer, lines for roads were surveyed out in different directions, and some of them among which was the route from Stockholm through Potsdam to Canton, was so far cleared of underbrush as to allow the passage of teams. 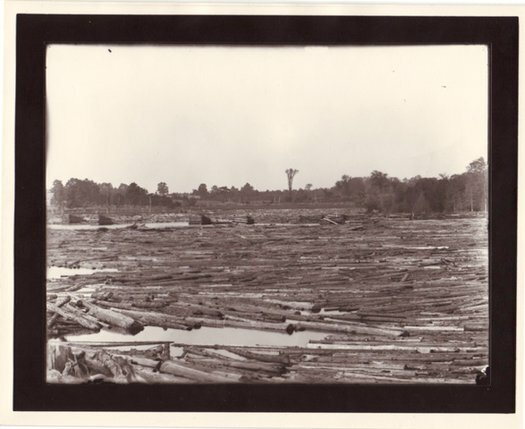 The frame of the sawmill was the first building erected in Potsdam. Mr. Raymond had for two or three years traversed all this country, surveying, and was sensible to the superiority of the soil here before commencing a settlement. Ebenezer Patterson was the first man to move his family into the town. They lived in Raymond’s Land Office Building across the river and boarded the men who were surveying. During the year 1803, Mrs. Patterson was reported to have been the “handsomest woman in Potsdam”. In 1804, Mr. Raymond returned with his family coming by the way of Long Falls (Carthage). (Read “North of the Mohawk” for this section). His wife, Hannah Wright Raymond, was a sister of Ebenezer Wright. 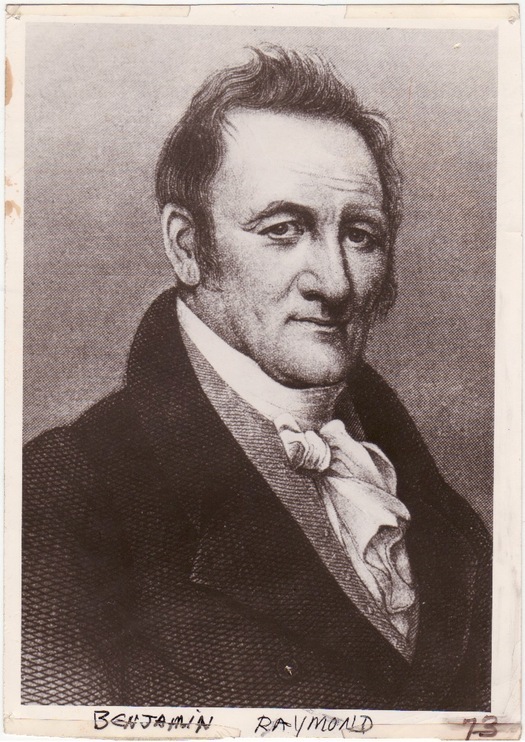 The same year – 1804 – William Smith (ancestor of Howard H. Smith. The deed of his land, purchased September 19, 1803, recorded January 3, 1806, is in the Museum, loaned by H. H. Smith), Gurden Smith, Benjamin Sweet, David French, Joseph Bailey, Bester Pierce, Roswell Parkhurst, William Bullard, and others came, some to select farms and to begin improvements preparatory to moving in; others moved in directly. 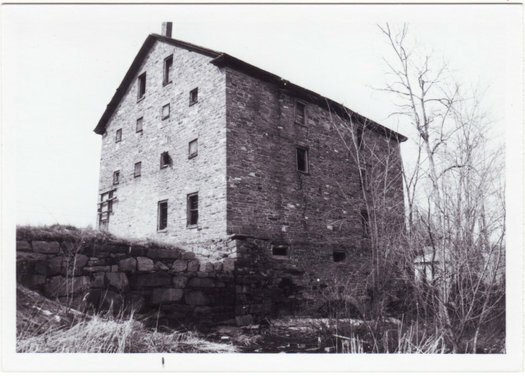 During the summer, a fine grist mill was built but not put into operation until 1805. Ebenezer Wright, brother-in-law of Mr. Raymond was the millwright. The first baby to be born in Potsdam was Orpha Maria, daughter of William Smith, born April 20, 1804. The same year (1804), Levi Swift, Charles Cox, Asa and Ira Perrin, and many others came and took up farms. In that year much of the land around Potsdam village for quite a distance was contracted for actual farms. The first frame building in town was erected by Mr. Raymond in 1804 on the west side of the river and was known as the “Fox and Geese” house because of its plan. On the 28th of November 1804, William Bullard and associates took up a tract of 2427 acres 2 miles north of Potsdam costing $8,656.04 with a view of establishing a colony having a unity of interests and on a plan he had drawn up in New England. Some withdrew, others joined. In May 1807, they formed an association styled “The Union”. The property was held in common stock, each sharing equally in the proceeds, according to the amount of labor invested. The company prospered to some degree. After dissolution, the land was divided and most of the members continued to reside on the tract. Evidently the Raymonds went back to Rome in the fall of 1804 and returned again in the spring of 1805, coming by sleigh and team by Oxbow on the Oswegatchie. The snow had left by the time they reached Oxbow so he made a raft of 30 pine logs on which they put their sleighs, goods and families, and proceeded down the swollen stream. At night they reached Richville. On the night of the second day (April 1), they reached Cooper’s settlement in Dekalb. The horses were sent around by the state road in charge of Sewall Raymond, a cousin of Benjamin Raymond. That same year, 1805, Horace Garfield, Jabes Healey, Anzel Bailey and his brothers came. Also most of those who formed the “Union” at Unionville. On the west side of the Norwood road, a little beyond the turn to Unionville, is the “Union” cemetery. The map of burials in this cemetery is in the Museum. John Smith and others by the name of Smith came from Tunbridge, Vermont, relatives of Joseph Smith, the founder of Mormonism. John Smith was high priest of the Mormon settlement at Salt Lake City in the Utah Territory in 1853.